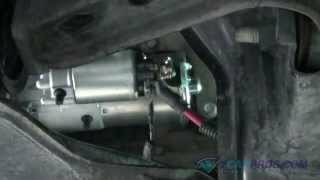 Starter Removal: Trick to Removing the Top Bolt. Trick to removing the top bolt. I attached the procedure for you as well as the pictures. The top bolt you get from the top. You will need to move a harness out of the way and use a 6 inch extension with the 14 mm socket. a. Disconnect the starter connector. B. Open the terminal cover. C. Remove the nut, then remove the starter wire. 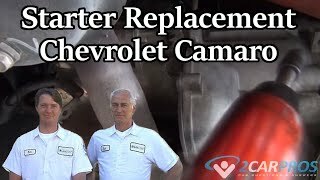 d. Remove the 2 bolts, then remove the starter. He says he can't get his hand in there. You do not get your hand in there, you get the socket with the extension. You dont get your hand in there, you get the socket with the extension. Removed what we think are the correct bolts but it won't budge. Give it a smack with a hammer. If it does not release then you did not remove the correct bolt. Yay! His hammer worked. Thank you. 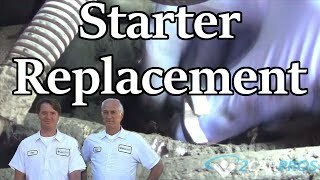 How To Replace The Starter Motor? Thanks.